Nestled on the slopes of Hualalai, the Keauhou Hideaway is a private retreat on 2.7 acres of lush tropical vegetation. The 800' elevation affords a spectacular view of the Kona coastline and ensures warm, sunny days and cool nights. Completely renovated in 2005 and 2012, the Hideaway is composed of 4 separate buildings linked to create a delightful courtyard perfect for breakfast smoothies. . The tranquil grounds are home to mango, avocado, fig, papaya and citrus trees. In addition, passion fruit vines, bananas, herbs and more await your discovery! Java sparrows, doves, finches, cardinals, and canaries wake you with their song. It is a spectacular place of beauty - a perfect place for your next Holiday! english, french, We speak language of those needing a true getaway! 5-10 minutes north takes you to the hub of Kailua-Kona, with all amenities & shopping from the quaint - to Costco! North of the Sheraton Keauhou Resort & Spa is a complete center with shopping, dining and theaters. A few more minutes north is full beach access. ...this beautiful, tranquil property consists of 2+ acres of well-tended flowers & fruit trees. With a true 'retreat' feel, it's a short walk or drive 1.5 miles to civilization! 5-7 Miles to the South, enter 'Old Hawaii', with it's unique resale shop and eateries, including the famous 'Mary's Burgers'...delicious!! East behind the property are views of Hawaii's National Volcano Park. Indoor dining ample room for 6, outside Lanai dining as well.. Both the Houla and Royal Kona Tennis Centers are within 10 minutes of this property and offer professional court service. 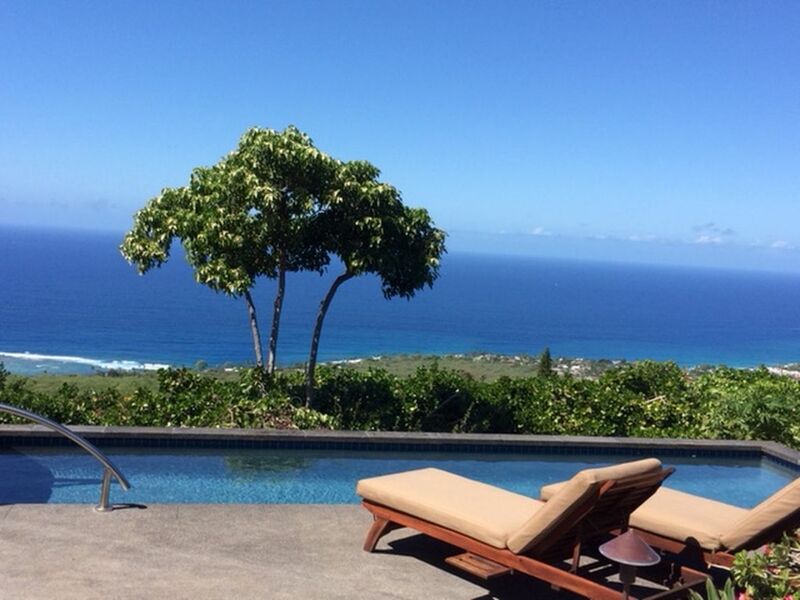 Keauhou Hideaway does not permit weddings, parties, or other events without prior permission. This gorgeous property is located just south of Kailua-Kona, 800 feet above the beautiful Pacific Ocean. The Keauhou Shopping Center, (Sheraton Keauhou Bay Resort and Spa adjacent), is directly below us, with great shopping, restaurants, movie theaters & convenient Post Office. This property and location has something for everyone...unwind on the newly appointed deck beside the infinity pool and jacuzzi, or sit on the lanai and take in the lush vegetation and fruit trees. Serene setting with panoramic Ocean Views, the tropical setting and bird visits are a delight. Just above our location, neighbor Alaina welcomes you with her Award Winning coffee at the Wailele Coffee Farm (tours available). If you wish, another neighbor will gladly provide farm-fresh eggs (see house info book or inquire with owner/agent). A visit to nearby Holualua, (up the hill from Kailua-Kona), you will find a delightful artists' community, coffee plantation and shops. The Holuakoa Garden provides a fantastic Brunch (Lunch & Dinner too!). The close by Kealakakua Bay offers snorkeling (see dolphin, manta ray among others), along with fishing & water sports. At the south end of the Bay, a cultural visit to Pu'uhonua o Honaunau National Historic Park - The Place of Refuge - is beautiful and unique - well worth a visit! For further excursion, we enjoy a day trip to Hawi at the north end of the Island, visiting Pololu Valley Lookout after eateries and shops along the way. The drive back on Hwy 250 through Parker Ranch (& Museum), and on ahead to Waimea is fantastic. We like to take Hwy 190 back to Kailua-Kona for a different view than the coast road... the Island's diversity is stunning - don't leave the camera behind! Our crew maintains the grounds and solar pool on a regular basis, and are never intrusive (you most likely will not know they are there!). To ensure you the best experience possible however, we will alter any maintenance scheduled during your stay if need be - just ask. Much Aloha!...we look forward to having you as our guests!